Have you looked at algorithm programming competitions? They sound like the perfect place to get the kind of data you’re looking for, with a lot of programmers participating. There are many to choose from (topcoder, codeforces, codechef) for some that take place weekly/monthly, or facebook hackercup, google code jam, for yearly competitions. 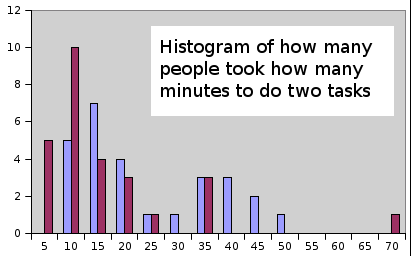 I haven’t analysed the data and the number of people that don’t complete the tasks in the allotted time is significant (the problems are supposed to be hard to solve in a short time for most contestants), but the differences seem to be a lot bigger than the numbers you talk about (especially if we take into account the large number of people that can’t finish a task in, say, 2 hours that the best coders complete in 10 minutes).